… often times is another woman’s treasure. But not always. Because taste and style are taste specific. Individualized. To each his own, I say. Not everything will appeal to everyone. This is just plain ugly. No ifs, ands or buts. More like the nail in the coffin. Okay…now you can come to my house and do that to the ugly fan in my kitchen/den. Thanks! I love that! and the stripes on the inside of that shade are AWESOME!!! Great job! I’m so inspired now… and I’ve gotten rid of all the ceiling fans that used to be in my house. Crap! it looks fabulous- much classier! Great solution.Love the new look. I love it, MUCH better, seriously!! Great job! I love the masculine look it has now now. I must say though, that the before pic looks quite similar to the ceiling fan in my bedroom, although my three glass shades are frosted white,rather than yellow. They are a little bigger, with broader ridges and prettier (IMHO) fluting than your before. Other than that, they are very, very similar. I remember my husband and I spending quite a bit of time on the fan aisle of Walmart choosing it in 1993. It was our anniversary present to each other. It was a bit of a splurge at about $70. We decided it was worth the money though because we loved it and it had a 20 year warranty. Well YEAH! (That’s similar to Hell Yeah, but the emphasis is a bit different, more like yes you bet). I owned that same ceiling fan/fixture at my last house, and I wonder what they did with it? I could peek in the winders and leave your link on the door. OH NO, wait…. I think I have something similar to that here, in this house, in my daughters room. Say it isn’t so! I love that your “far from perfect” looks like perfect in my world! It’s stunning! Did you need to turn the electricity off to do all the work? That couple strolling through a ‘mom and pop lighting store’ in the 80’s (because the big conglomerates had not taken over every thing from gum to cherry juice to pizza to tires YET) would have had two options in fans – the one they chose at your present home OR a 24X24 monster that sat on the floor next to hubby’s recliner, which when ON made him get up and turn the volume up to HIGH on the TV set! ps – And I like Whitney, thought, you bought that fan like that!!!! OK, true confession time: I was once part of that couple. I bought several brass monstrosities when my husband and I were building a house in the early 90s. Like Kolein notes, there weren’t many choices. And, I had no idea what I was doing or what the options were. (Unfortunately, in husbands as well as fans. Don’t have either of them anymore.) Just want to give you a big high five for the idea, though, that some things are just plain horrible, regardless of style or taste. Goin’ out on a limb and saying that faux-wood anything is one of them! This is brilliant! We love how much personality you added to the room with this!! I love it! I’ve been trying to get rid of ceiling fans in our house, but my husband loves them, so no dice. You really did a great job transforming that fixture though! This is a fabulous transformation!!! Love it, so much more today! Wonderful job! We all dance to the beat of a different drum shade! I was waiting for the whole chandy-fan tutorial! It’s amazing. No more words, I’m typing with one hand while nursing and “reading” Amelia Bedelia. Aaaaah! Thanks for the mention! Your fan turned out so well! It looks so modern and sophisticated and perfect for the space. Loving the drum shade, too. I have a shade stashed that I’ve been planning to use on another fan, too. Terrific job! I love this SO much! Such an impressive transformation! 17 years with that – did you avert your eyes whenever you entered your son’s room? Did you flee quickly when dropping off clean laundry? 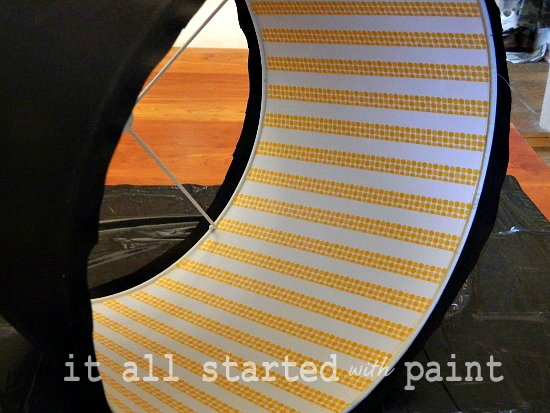 Love it – especially the washi tape! Now you can linger in your son’s room and admire your work of art! I think I hear Home Depot calling. Just ran across your site from Savvy Southern Style and I have a few of those “vintage” ceiling fans that are in desperate need of renovation. This is a silly question but did you spray paint or use a brush to paint the silver? I am trying to get the courage up to re-do mine. 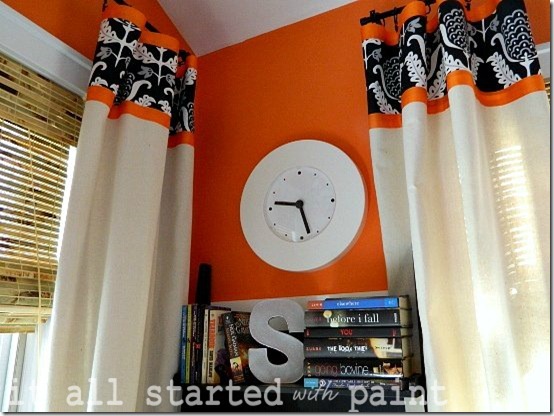 I had no idea that you could make over a ceiling fan like that! I’m definitely pinning this for when we move into our new house. There are some ugly fans in there that can sure use some makeovers. lol It’s not like that fan and alot like it haven’t been replaced by now by alot of people. We had some in a house we had and that was first thing I replaced. We didn’t have alot of choice in the 80’s as to style, at that time that was the ultimate in style, shudder, shudder. Fans do serve a purpose tho. We have them in our living room, mud room and master bedroom. We replaced the ones in living room and our room as they were just like yours. UGH. I’d love to have one of fans with really aweswome looking tropical fans on it but that was way out of our budget. At night it gets cold with cooler going so we turn cooler off to just have the fan running. But we’re old so we get colder, lol. Our bedroom is like an oven tho so fan usually gos all night on low. Lowe how you overhauled that fan, what a difference. I think they do have replacement blade holders also now that are much more attractive in case you decide you want to replace those also. That barrel shade makes such a big difference. The fans are kinda hokey but they do serve a purpose depending on where you live. We have a single wide and the only vent for our cooler is in hallway in front part of the house. Our kitchen, mudroom and bedroom/bathroom don’t get any air so we die in that end of the house. Hence the ceiling fans. When I’m in my studio and sewing room (front part of house) it gets really hot, sweat running. Good places to lose weight. I’m still waiting to get ceiling fans in those rooms and they’re tiny to boot, phewy in summer. Really stupid not putting any other vents for the cooler in other end of house. We have an evaporative cooler, most people do here, (Grand Junction, CO). 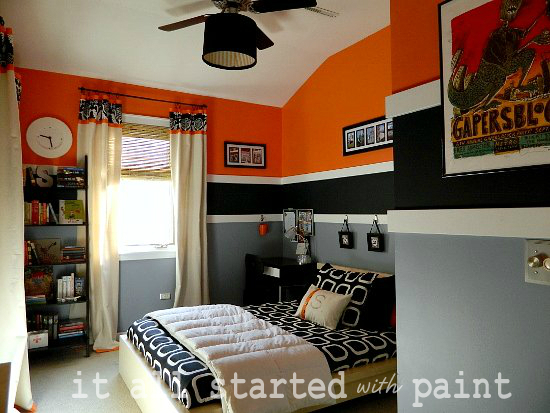 Thanks for sharing your ceiling fan project, it rules. I’m going to see if I can find a barrel shade for fan in the living room. The lighst are pretty glarey when we turn them on. On top of that, UGH I’m embarrassed to say there are mirrors on ceiling around the fan. DOUBLE UHG! Got any ideas what I could do to those horrors? Hello, Newest linky follower, love what you did with the fan! Very clever! I will return to check out your blog, hope to see you visit and follow! came over from DIY showoff. What a great idea! pinned it! OMG!!!! I have the same ceiling fan! LOL It too came with my home. In fact I have two of them! Does the drum shade move or make noise when the fan is on? One is in my master bedroom and although I cant stand how is looks I like the breeze it makes. Also mine seems really low? How did you attach it to the fan? Did you have any issues with the balance of the fan once it was attached? I used picture frame wire to attach. And, no, nothing happened to the balance of the fan!